Campbelltown City Council has granted the Monarch Investments Group (Monarch) development approval to build its new masterplanned community – The Meadows, which is a $135 million project, located in Sydney’s South West growth corridor. Two hundred and ten houses will be built in The Meadows which is situated in the suburb of Bardia at the junction of the M7 and M5. 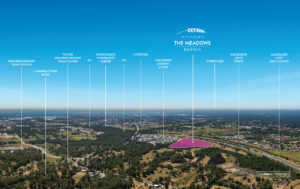 The Meadows is located directly beside Monarch’s Ingleburn Gardens Estate and across the road from the company’s first major development in the area, Macquarie Links Estate. Over the past 60 years, Monarch has sold over 6,000 land lots across Sydney and New South Wales. More than 1600 of these sales were secured in the South West. Monarch recently sold the last remaining house and land package in its $160 million Ingleburn Gardens Estate comprising 329 house and land parcels. The state government has committed to invest over $3.6 billion in its Western Sydney Infrastructure Plan over a 10 year period. This plan includes investment in health, education, transport (bus and rail) and community infrastructure. Mr Icklow continued, “The investment potential in the South West is significant. We sold our first house and land package in 2009 in Ingleburn Gardens Estate for $325,000. Today it is worth $650,000 and is renting for $500 per week. Based on these figures, within the 10 years I expect house and land sales in The Meadows to eclipse at least $900,000 based on an average annual 5 per cent increase over that time. Recently released data from CoreLogic RPData revealed the suburb of Bardia was ranked seventh in a national list of suburbs with the biggest rise in median house price growth between 2010 and 2015. A swimming pool, playground and recreational facilities will feature in The Meadows. The community is located within one kilometre from Edmondson Park Train Station and the billion dollar Edmondson Park Town Centre. It is a short drive from Crossroads Homemaker Centre which includes Costco, Bunnings and Bing Lee. Sydney’s CBD is an approximate 45 minute drive and the proposed Badgery’s Creek Airport will be located within a 20 minute commute.